1.) My little hummie waited impatiently last night for me to freshen his nectar, then quickly stopped by to enjoy. 2.) I’ve shared with you before that Sundae loves us to put her “blankie” over her when she’s on our bed. 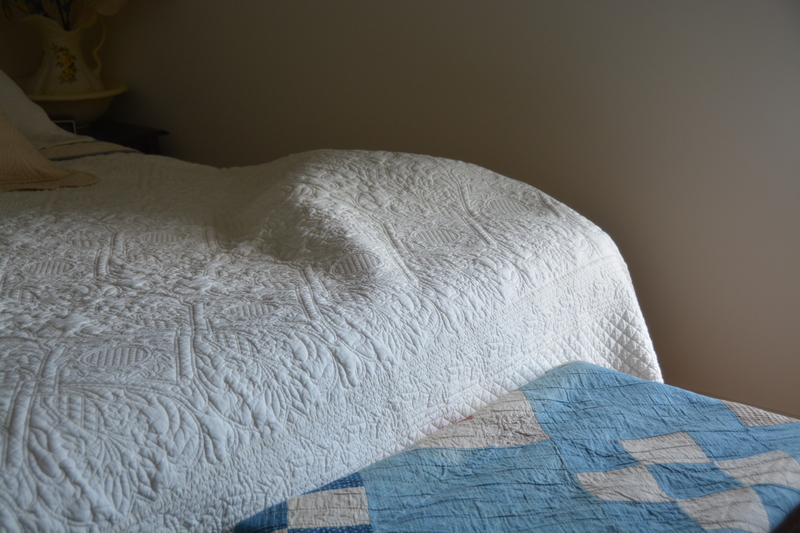 And, that she wreaks havoc on our upstairs guest room bed, trying to get under the throw at the foot of the bed. Well, she now has a new trick. She’s learned how to get under the quilt on our downstairs guest room bed. All by herself. 3.) 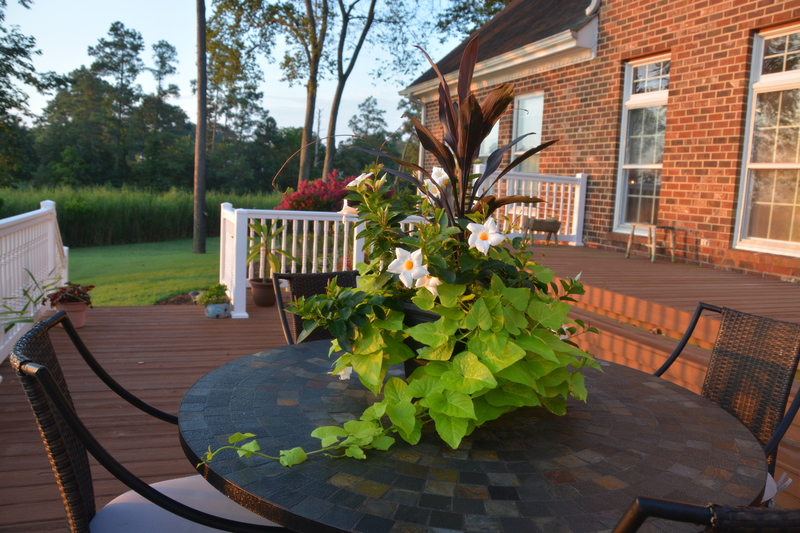 Remember this plant combo that I bought recently for the table on our deck? 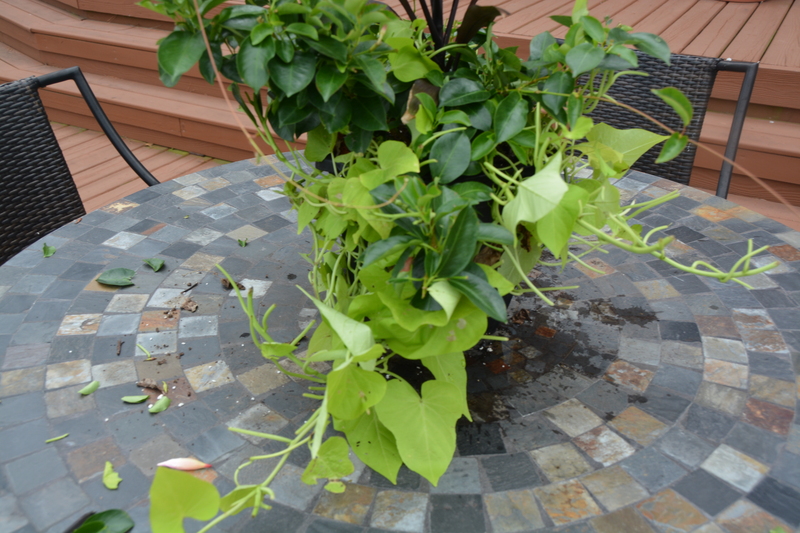 Apparently, our resident deer decided to climb the three steps to our deck and dine on the sweet potato vine. Now that we know they can maneuver steps, perhaps we should invite them over one evening. Anyone know what beverage goes with sweet potato vine? 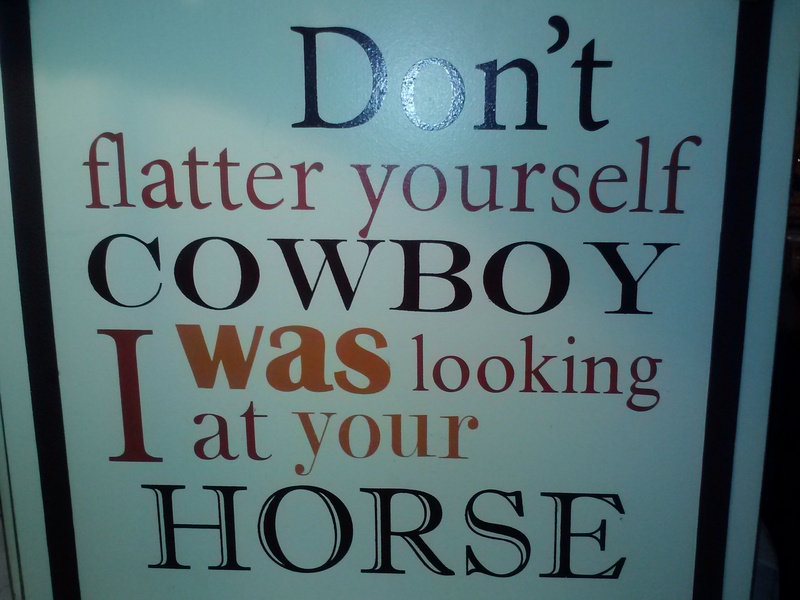 His version: “That trooper said: ‘Don’t flatter yourself, cowgirl, I was blowing at the horse’ “. 5.) 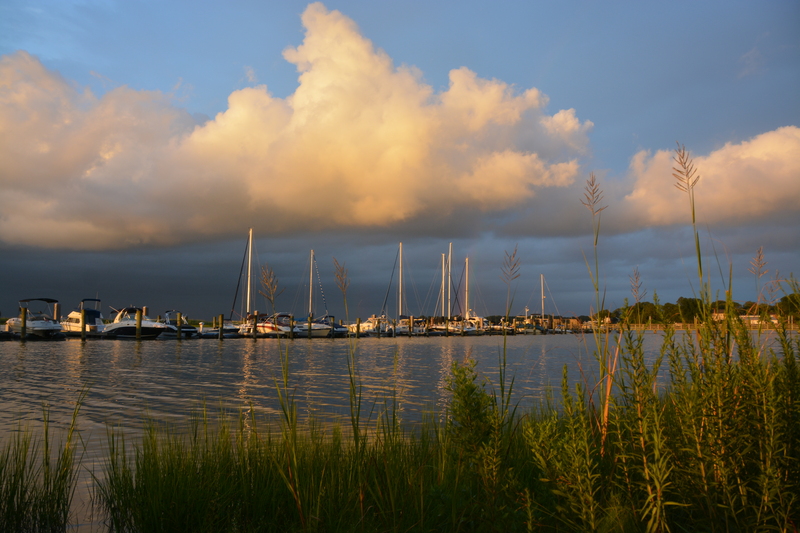 Tuesday evening, around sunset, we had rain across the river to our east. The clouds made for some amazing scenery. This entry was posted in Days at Home, Sundae, Traveling Days and tagged aggie the horse, hummingbird, marina and clouds, sweet potato vine. Bookmark the permalink. Nice batch of “random” ! 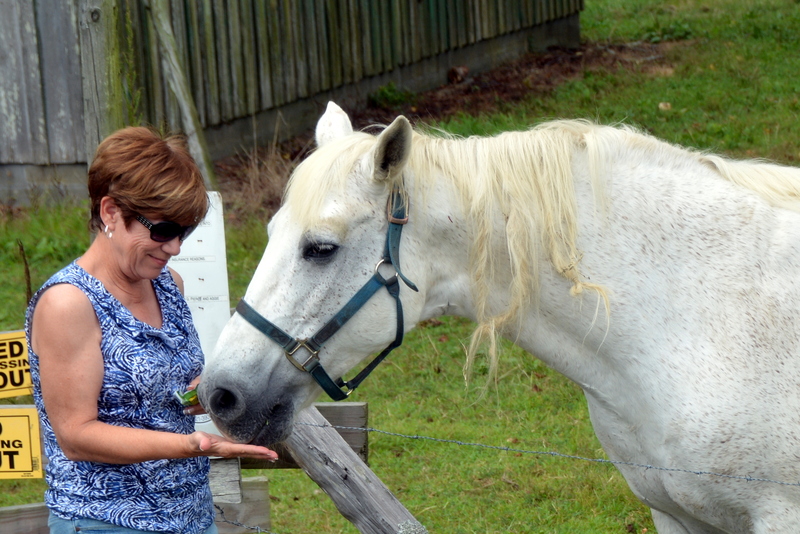 I remember you showing us your deck planter – are you sure it was deer? I found a squirrel sitting in the middle of my sweet potato vines one morning on the deck munching away on leaves! Little devils! I love your randomness! The plants were just too tasty to leave untouched and iI saw that Pam said she had squirrels eating them as well which surprised me! I can not imagine they would eat vines like that as well. Crazy. 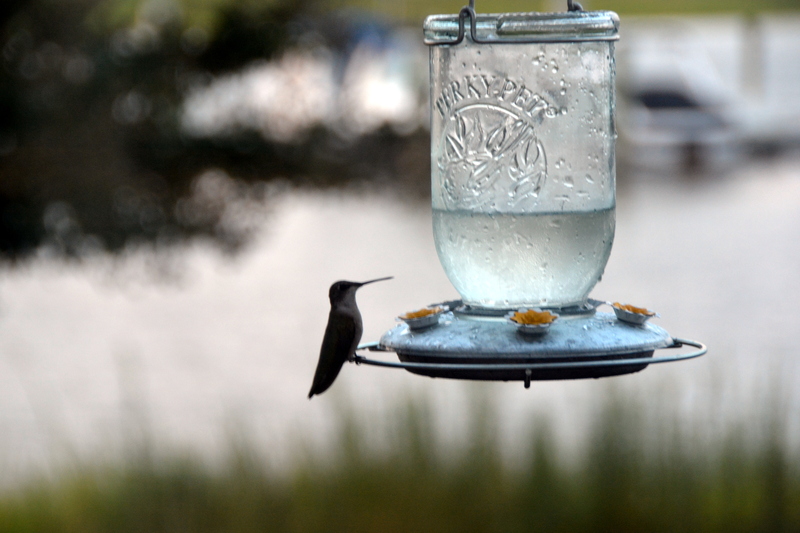 I am enjoying the hummers at the neighbors house until I can get moved and see what I can find at our new place. Wow, I’ve missed you while I was gone. Such a nice post to greet me this morning, back in Va. once again. Proof that living life is random sights and experiences. I’m glad you had nice ones this week! The deer love to pull our pansies on the porch – our steps are no hindrance. And the squirrels like to dig in my Christmas cactus that I put on the porch for some fresh summer air – I wonder if they’re burying for the winter. There’s nothing like being ‘brought back to earth’ with a quick quip! Love ALL the randomness. Great weekend to you. Great batch of randomness! Happy weekend to you too! This is a good batch of random – a nice way to start the weekend ! Love the pic of Sundae … she’s gotten sneaky with it, huh? & the deer are always sneaky … they’d probably come right on in and sit down at the table ! Love them all. Especially the cat lump. Haha. What goes with sweet potato vine?? Uhhh, vodka? However, stumbling drunk deer might be a problem too. Great R5F, love the last picture. Very nice Random 5… except for the poor plant on the table!